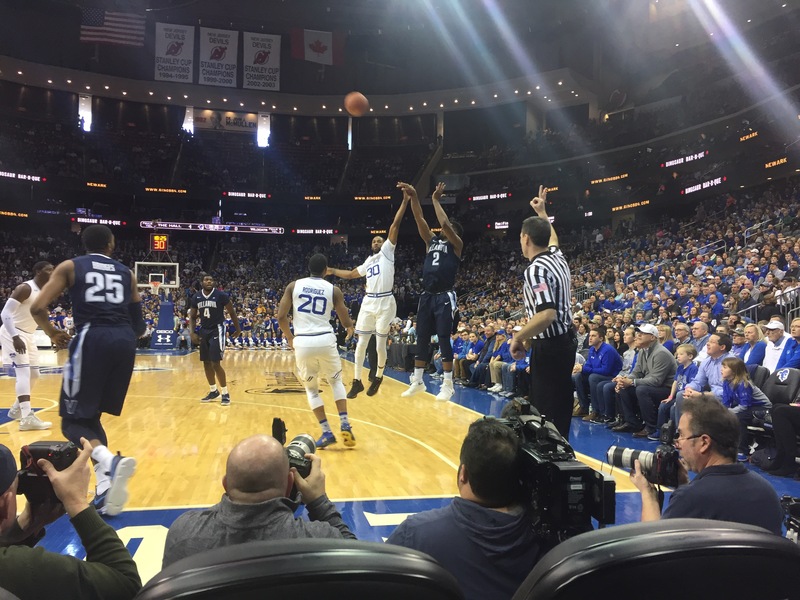 Newark, NJ– The Villanova Wildcats showed the Seton Hall Pirates and the record crowd that packed the Prudential Center on Saturday afternoon that they’re ranked number two in the nation for a reason. Behind the stellar play of Jalen Brunson, Kris Jenkins and Josh Hart, the Wildcats efficently destroyed the home Pirates by the score of 92-70. It’s a rarity to have the upper bowl of the Prudential Center open for Seton Hall games but demand for tickets made it so. 17,000 fans flocked to the matinee in downtown Newark Saturday, tailgaiting in parking lots and giving the game a unique feel to the fans in Central New Jersey. Both teams came onto the floor to a raucous ovation and when the ball was tipped the energy in the building was palpable. The spotlight was on both team’s guards with Seton Hall’s Khadeen Carrington coming off a 41 point game vs. Creighton on Wednesday going against Brunson. It was Brunson who started fast with hitting a few jumpers after an opening Seton Hall run. The Pirates went ice cold in the middle of the first half and Brunson and Hart took advantage. Villanova went on a 16-3 run in the first half behind their all-world players but Seton Hall fought back to cut their deficit to 1 with two minutes left in the half. Then, another gear kicked in for Villanova. A gear that made them national champions last season and the number two team in the country this year. The Wildcats caused several Seton Hall turnovers and Brunson and Jenkins methodically hit open shots to end the half on an 11-1 run for the Wildcats. The Pirates looked shellshocked as they went into the locker room down 42-31. As the fans started coming back from the concourse after halftime, Eric Paschall (transfer from Fordham) got the second half started the same way the first half ended for Villanova. The burly forward hit two quick three-pointers and a layup as Villanova extended it’s lead to 16. The once frenetic crowd settled into a malaise as Jenkins and Brunson answered every Seton Hall basket with a basket of their own. The surgical precision of Brunson was on display for the entire game as he went a perfect 7 for 7 from the field. Jenkins shot a red-hot 8 for 10 from the field for the game as well and they both ended up with 22 points. Hart had 19 points, most of them coming in the paint on backdoor cuts. For the Pirates, Carrrington followed his 40 point outburst on Wednesday with an efficient 22 points on Saturday. Angel Delgado had his usual double-double with 19 points and 12 rebounds. Three-point specialist Myles Powell was kept in check by the Villanova defense. With Seton Hall’s win against Creighton on Wednesday followed by today’s loss to Villanova, the focus is now on Wednesday’s home game against Xavier. A win against the Musketeers could propel the Pirates chances into an NCAA berth. While Seton Hall couldn’t give the record crowd a victory today, both coaches recognized the passion of the fans today. A win would’ve been nice for Pirate blue but sometimes you have to appreciate a truly great team giving a trademark performance. Thanks to Villanova’s play, everybody in the crowd got their money’s worth on Saturday.